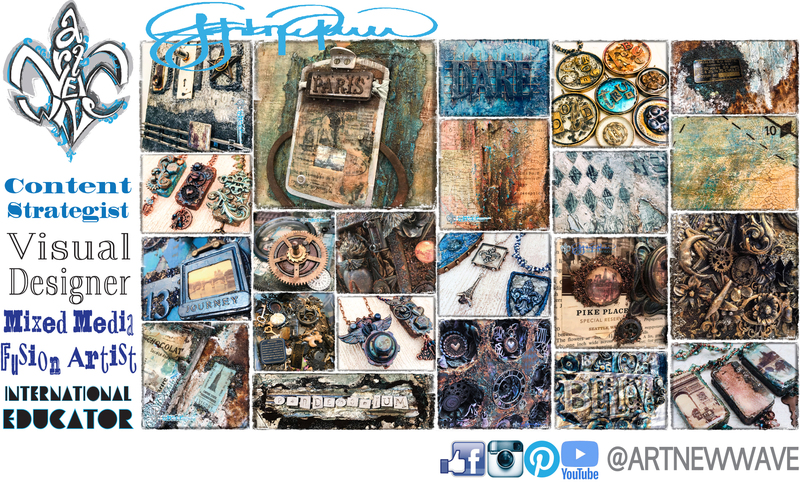 Over the years, my mixed media canvases have evolved to incorporate many found objects, highlighted with metallic colors and fabulous textures. I absolutely love creating each one of these masterpieces, and I wanted to take a chance to share with you the process I used in building my artwork. I like to use 8″ x 10″ canvases for these types of projects, simply because of the size and that you can usually purchase this size of canvas in value packs at most art stores inexpensively. To add more dimension to my canvases, I like to add “windows” onto the canvas and for this project I added a basic wood frame. For more texture, I used muslin fabric with Clear Sculpture Medium and heat set with a heat tool. Although most of the time I like to “eyeball” the placement of my elements on my projects, you’ll notice that I drew lines on the canvas to center the wood frame onto the canvas. For the base layer of the canvas, I stipple brushed Brown Rust Paste onto the canvas and sides of the wood frame, and then brushed the paste onto the fabric. With a palette knife, I then added the paste around the frame and sprinkled Mega Art Stones around the frame followed with the small (regular sized) Art Stones to fill in the gaps. While the Brown Rust Paste was still wet, I began to stipple brush Blue Patina Effects Paste onto the canvas, stones and edge of the frame to create a moss color and then heat set. Once the background was dry, I stippled another layer of Blue Patina Effects Paste to add the blue color onto the background and then heat set this layer. For more added color, I used my finger tip to highlight the background with Red Rust Effects Paste and heat set to avoid blending colors. Next I highlighted with Yellow Rust Effects Paste, again just using my finger tip for a light touch. Once dried, I finished the background with a touch of Brass Patina Effects Paste. With the background complete, it was now time to start working on coloring the embellishments. I used a base coat of Heavy Black Gesso for all of the embellishments because I love how it makes the Metallique paint colors more dramatic! I then highlighted the embellishments with the following Metallique paints (in order): Blackberry, Steampunk Copper, Midnight Blue, Deep Waters. For a true metallic highlight I then dry brushed Brass Patina Effects Paste onto the embellishments. I often tell people that creating beautiful layers of metallic color that it’s like making spaghetti sauce from scratch – it takes time and patience, but the results are absolutely stunning and create subtle layers of color that can’t be created any other way. I wanted to share with you some of the techniques I use for creating my embellishments, many of which you can incorporate into making jewelry also! For the pocket watch, I first placed down the Vintage Watch Face onto the frame. Fill the bottom of the pocket watch with Brown Rust Effects Paste, the generously sprinkle with Copper Micro Beads to create the background of the watch. With clear glue, I layered a Mechanical Flower with a fleur de lys and allowed to set while working on placing the other embellishments. You can use this same process for creating other layers of Mechanicals embellishments. For example, along the top of the wood frame I used a large Mechanicals Wing as the base and then adhered a small heart locket onto the wings. Using the same technique as with the pocket watch, I filled the background with Copper Micro Beads and then placed a Mechanical Lotus Flower with a Mechanicals Bolt Top inside. Sometimes the best part of working on a mixed media canvas is layering and adding all of the embellishments into place. I like to add my embellishments to my projects last because I enjoy having the freedom to move embellishments as I work. Using Brown Rust Paste as my adhesive for holding down all of my embellishments, I placed them in sections so that while the paste was still wet I could add my inclusions. When adding my inclusions, I typically start with the “chunkier” inclusions and use the smaller ones to fill in the gaps. After placing the embellishments, I sprinkled Gold Leaf Mica Flakes into the wet paste and then added Pitch Black and Copper Glass Glitter, followed with a variety of Micro Beads for color: Pitch Black, Copper and Splash.